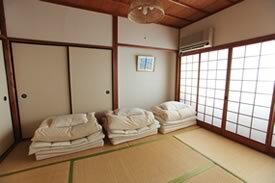 Nara Ugaya Guesthouse provides you not only reasonable but clean and comfortable accommodation. 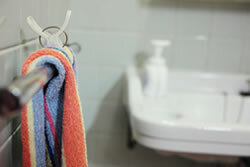 Linens like bed sheets and pillow covers are always fresh, and we keep the bathroom and the shower room perfectly clean and tidy all the time. 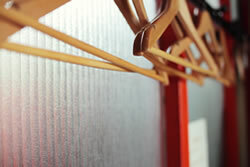 We have ladies and mixed dormitories, rooms with bunk beds and a Japanese style room with futon. Each bed has a socket, a reading light, and a curtain for the guest’s privacy. 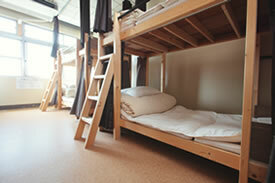 If you are not sure about staying in mixed dorms, we assure you there’s nothing to worry about. Since we opened Ugaya Guesthouse, we have been hearing from so many guests that they slept very well. Some say it’s way cozier than their own bedroom! We deeply appreciate every comment. At the lobby, we have tatami floor, Japanese tea table, a table made from Yoshino cedar, and a comfy sofa. 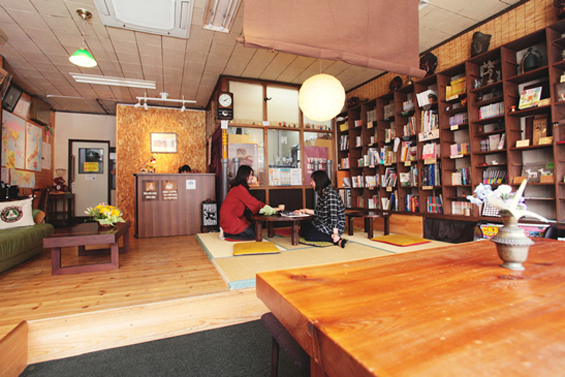 Make yourself at home and enjoy our collections of books about Nara. Some books are very rare and full of discoveries. Our guests come to Ugaya Guesthouse from various countries and from all over Japan. Age, backgrounds and the purpose are all unique and different. Some travel solo, some with friends, some with their families. Some stay here to attend academic meetings and seminars. Payment in full is required on your arrival. CASH ONLY. This rate is available only for direct reservations by phone / email / form.